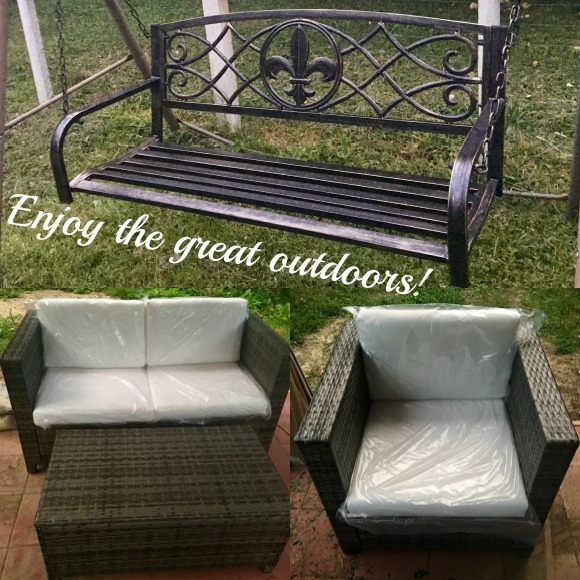 Stacy Tilton Reviews: Enjoy the great outdoors! Do you want to get outside and enjoy the great outdoors? I know I would like to pretty much every day of the week! I mean who wouldn't agree that sitting in a swing enjoying the breeze or kicking back with your feet up wouldn't be nice once in a while? Living out in the country it's something I like to do outdoors when the weather cooperates. Of course that doesn't mean I always get to do it. Many times though my day is so full and busy I forget to take a few moments and just sit down and relax. But when I do get the chance I now have a quaint little area to just sit back, relax, and enjoy the beauty that surrounds. We've been working on setting up a patio area out back of our house for a few months now, and it's almost finally complete! 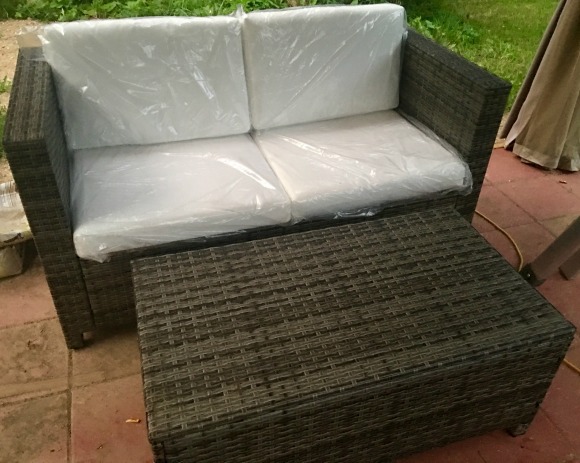 We have the patio blocks set, gazebo up, and now we have a full 4-Piece Wicker Sofa Set to enjoy while we relax. As you can see I haven't taken the plastic off of the cushions yet because I want to keep them nice and clean until we are finished with the patio. There's still lots of sand that has to be cleaned off the bricks and a little more sawing to be done so I'm waiting. I want the set to look it's best when we are all finished and I have people over for the first time. But if you're curious even with the plastic on them the cushions are super comfortable. I was actually pretty impressed with them when setting them up on the chairs and sofa. They fit perfectly and don't fall down or slide off when you're using them. Plus they have zippers on the outer covers so you can take them off the cushions and wash them if necessary. This will be nice because I won't be so worried about the kids spilling anything on them. This set is very nice quality and very sturdy compared to some I've seen in stores. The ottoman table is the perfect height for putting your feet up while sitting on the sofa too! • 2 club chairs, 1 sofa, and 1 ottoman table. 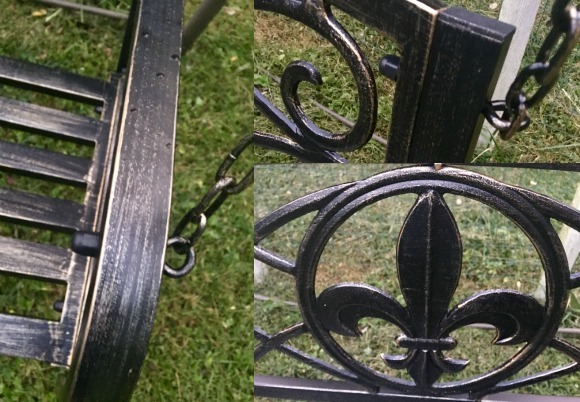 • All furniture is made to withstand the outdoors, with water-resistant high-quality polyester and wicker. • Cushions for the sofa and two chairs, made with stylish woven fabric. • Overall Dimensions: 52”(L) x 21“(W) x 19“(H); Weight Capacity: 485 lbs. I would love that sofa set for my backyard. Looks really nice.